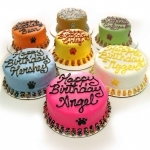 Customize any of our Cakes for your Event or Holiday. You can even add your Dog‘s Name! Choose a Size below then choose from 4 flavors and your Colors! We use all organic ingredients to bake our cakes. For dogs with allergies we offer a Grain Free option. 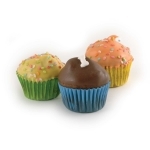 When that special day arrives celebrate with Mini PupCup cakes! 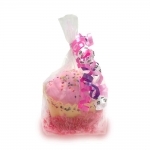 Whether it's a big daycare party, Valentine's Day or Christmas these little gems are an affordable treat for bigger parties.